ticular. This month should be very interesting, since the summer months are usually slow, and August is very summerish as we know. 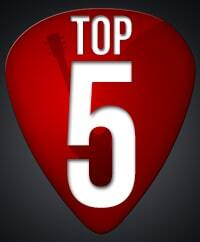 I'm changing things up a bit from this month as well, since if you've been keeping track of these monthly stats posts, you'll know that I append the top 5 tutorials with as many as needed, to show the top 5 song lessons. This was done because the basic (non-song) lessons were usually among the top 5 as well. From now on, I'm just going to show the top 5 song lessons, without detailing which basic lessons were in the list. They're usually the same, and of not much value anyhow. Last month, there were 3 basic lessons among the top 5 most viewed tutorials, just so you know. There are usually 4, so this shows me that there were a bit fewer new players on the site. Without further ado, let's have a look at which song lessons were most popular. This Chuck Berry classic is among the top songs of the month 98% of the time. It's just an awesome "oldie but goodie", and it's lot's of fun to play along with the original song, even for early beginner guitar players. Just watch the speed. If I had to take a guess at which songs would be in the top 5 list month after month, Samba Pa Ti would be among them. Santana is a great guitarist, and the fact that so many people want to learn his songs month after month just proves it even more. My video tutorial on the Spanish guitar style is another favorite lesson of my students. I've been meaning to record new Spanish style lessons, but I don't know whether you would prefer these genre-based lesson, or the song-based lessons. Let me know in the comments. Satisfaction was a new song this month, it's one of the most popular songs by the iconic Rolling Stones. It's a really great song to learn, so if you're into the electric guitar, make sure you check out this video. It's loads of fun playing along with the backing track as well. The top spot goes to Mad World, the theme song for the movie Donnie Darko. This song is meant to be played on the acoustic guitar, but if you have an electric, you should still learn it. It's very simple, and will teach you a lot about chords, strumming and arpeggios. There you have it, the most watched lessons of August. I hope it gave you a bit of motivation to go grab your guitar and start playing!